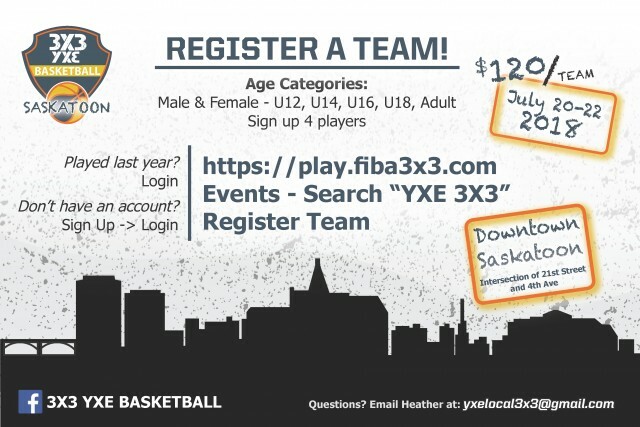 The FIBA 3X3 World Tour is coming back to Saskatoon!! In addition to this amazing event, we are also hosting a local tournament! The local tournament will be held in the mornings before the World Tour so participants in the tournament will be able to watch the professional games. We are looking for more teams in every age group! The 2018 local tournament will be Friday, July 20th to Sunday, July 22nd and costs $120 per team. Payment will be accepted online! I have attached our registration poster. Please pass along to anyone who may be interested! !